FREE SATURDAY BOOT CAMP with Texas Fit Chicks! 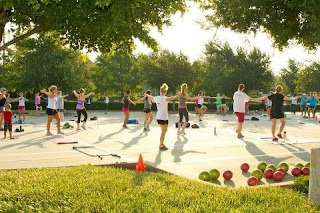 Come get a great workout with Melody and our group of TFC trainers! Burn tons of calories and start your weekend right with a fantastic bootcamp workout! Lots of Freebies too! Bring a friend and you both will get a FREE tank top, Urban Extreme will be giving out goodies as well as My Fit Foods! Limited space so RSVP today! What to bring - Water bottle, yoga mat, lots of energy! Bring a friend and you BOTH will get a FREE tank top!! Limited space - only 10 spots left, so secure yours today!